Dev's Pick | [username] Approved | Stock turboshaft engines, airplanes and helicopters. Here’s my fourth turboprop airplane, the 77I-Fw 190A! Born on February 25 2015. An even better and more powerful engine than the previous type, this one uses the PO8R: 8 blowers & 16 turbine blades, with a 3 bladed prop, producing 170kN! Very easy to fly, much easier than the previous one! This one is pretty close to the original in shape, although very large and without a radial engine. Why? Because we can’t build radials yet! New! Improved version! Less airframe mass but more fuel! Increased speed! Better looking cockpit! Range almost doubled! This is an improved version of the Fw 190A 1.0, the Fw 190A2. Born on February 26 2015. It’s got an improved prop for more high altitude performance, less mass and A LOT more fuel: 2700kg in the drop tanks and 3000kg behind the chair, for a total of 11700kg fuel. Flying time increased from 25 to 45 minutes at full power. A lot of extra piping makes sure that all the blowers keep running even if tanks are unevenly drained. 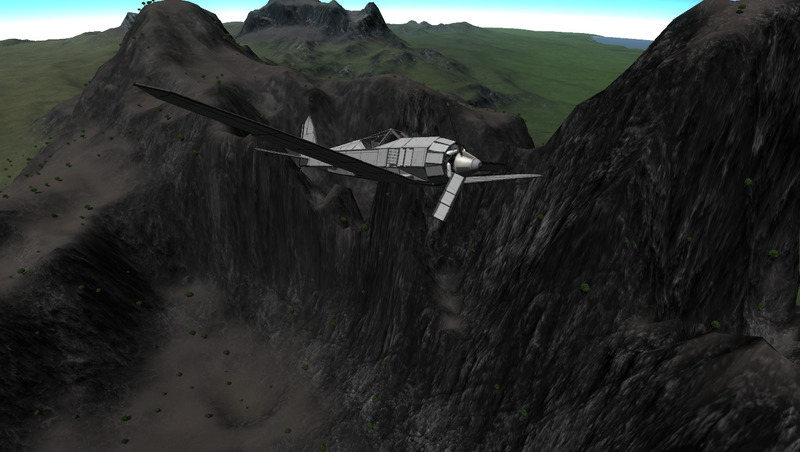 Warning: just like in real life, doing aerobatics at high speed may result in sheared off wings! Top speed? Haven’t tested it yet. Remember, this plane is gigantic and very heavy, but not with the scaled power of the original. Unity/KSP need some adjustments in the physics department to be able to build small. Top speed will probably be around 70m/s at 7500m. A stock aircraft called 77I-Fw 190A2. Built with 640 of the finest parts, its root part is Mk1FuselageStructural.